Travelling north: Turn right into Enderley Ave, left at Esplanade, continue along Esplanade past Cavill Mall to the third building past McDonalds. 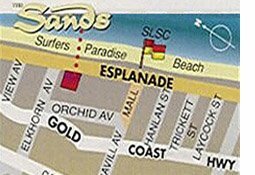 Travelling south: From Gold Coast Highway turn left into Elkhorn Avenue, (just past Holiday Inn), turn right at Esplande. The Sands is the second building on the right.